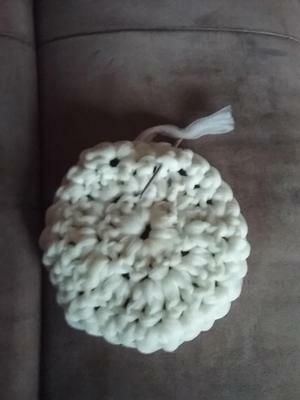 This is a scrubbie made with tulle fabric. The size of the hook you chose will determine the size of your finished project. The larger the hook the larger the project. Row 2 Chain 3 ( this counts as the first double crochet) crochet into the ring 11 times. 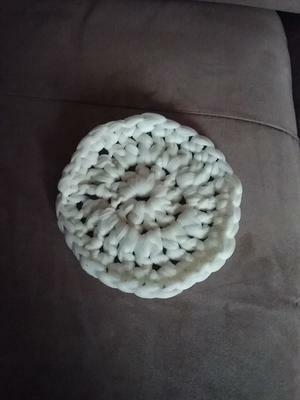 Row 3 Chain 3 and into the same space work a double crochet. 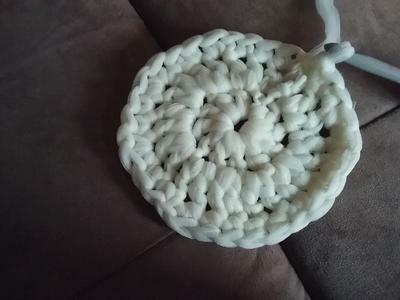 Stitch two double crochet into each of the spaces around for a total of 24 double crochet. Row 4 Chain one and work a single crochet into each space for a total of 24 stitches. Weave your tail into your work in three different directions. This way the tail will not work it's way loose with repeated use. Tulle is available in many colors. Do you have a problem thinking of gifts? Wouldn't this be cool in a fancy basket with some lovely soap for beside the sink?